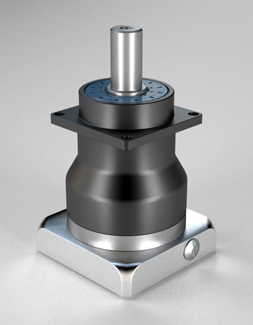 Mount Prospect, IL - July 10, 2012 – GAM Gear introduces the SPH series inline planetary gearbox. Featuring helical gearing, the SPH brings a new level of power and precision to an extensive portfolio of gear technology which includes hypoid, spiral bevel, spur, and worm. The SPH is designed specifically for dynamic and cyclic motion control applications and can be optimized for high speed and continuous duty applications as well. The SPH gears are cut at an ideal angle to help reduce axial forces that are traditionally associated with helical gearing and then ground for reduced noise levels and improved smoothness and accuracy. The gear teeth are also wider which allows for larger permissible torques relative to the frame size and heavy duty taper roller bearings enable large loading capabilities. Available in six frame sizes from 50mm up to 180mm and with ratios up to 100:1, the SPH is offered with several output configurations for simple machine integration including shaft (smooth or keyed), hollow with housing, and integrated coupling. As with other GAM products, the SPH can be modified or provided in a complete custom design to meet customer specific requirements.